Grocery shopping can be an overwhelming task when you or loved one has a dietary restriction. As a gluten free shopper, on most occasions, I am constantly finding new products that promise to be “tasty”, but are often tasteless. It’s wonderful that more and more companies more open to making gluten free products; and now almost every grocery store carries aisle that can meet any dietary needs, from sugar-free to soy-free there is something for everyone. The only problem is trying to decipher between them all, do they really taste as good as they look? Have no fear! I have tried them out, asked my expert friends and foodies, and found some of my new favorite gluten-free, and some casein-free foods. Check out the ones I just can’t get enough of right now. 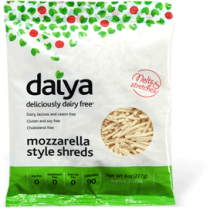 D aiya Cheese: A few months ago, a friend introduced me to this amazing product. At a local pizzeria, I tried a gluten free pie; little did I know it was also dairy-free, made from Daiya cheese! I couldn’t even tell the difference! The texture was spot on- it melted perfectly, and I couldn’t stop myself from having an extra slice. One of the best pieces of pizza I have had in NYC and it was dairy-free and gluten-free, can you believe it? They also have a variety of other delicious flavors that please even the pickiest of pallets. 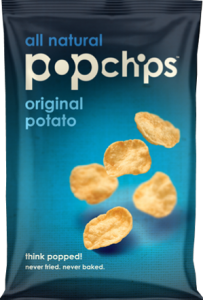 Popchips. These certified gluten free chips that are really amazing. They are just like potato chips b ut honestly- they are better! You won’t be able to resist their crunchy charm, all the while knowing that they are actually healthy! 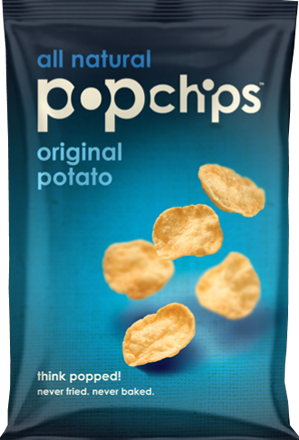 With 100 calories and about 3 grams of fat per serving, you will feel much better about munching on these then calorie laden potato or corn chips. Trader Joe’s Garlic Hummus Dip. By far my favorite hummus on the planet! It is so delicious and zesty, perking up a normal cracker or bell pepper into a delicious treat. It has a very light and airy, almost whipped, texture, which is very pleasing to my pallet. Eat it as a snack; add to your favorite sandwich, or salad. A great source of protein and its only $3.99 for 16 ounces, quite a deal! Soy & Almond Dream Milk or Creamer. On accident, I stumbled upon this amazing alternative to lactose. Buying creamer at the store, I grabbed this one without thinking, and I am happy I did. It is gluten and dairy- free and tastes amazing. I actually prefer it to cream, it is much healthier with 130 calories per serving (Original flavor) and 7g of protein, I use it in my oatmeal and anything that calls for milk. My friend who is vegan and gluten-free, uses it in her Mac and Cheese and swears it cooks as well as cow’s milk, it was just as creamy as the original. 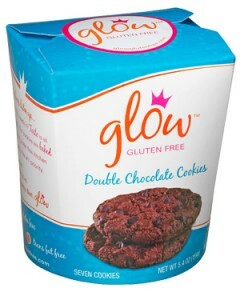 Great for kiddos who can’t tolerate casein or lactose (and goes really well with those Glow Gluten Free Cookies). If you cant have soy or dairy, this is a great alternative. It’s made from almonds and has a texture that is similar to milk. I have it in my coffee, smoothies, or over cereal. The chocolate is my favorite! It’s actually lower in calories that cow’s milk and has a variety of nutrients. If you are trying to make a dietary change for you or your family, research the products before you stock your fridge. Buying products that look great in the box, but taste like cardboard will only make you more inclined to go back to your old patterns. Make sure to check with us, your friends who have dietary restrictions or blogs that are honest about their experiences with these foods. Happy eating!